I'm happy to say that tonight I have reached my goal of 50 articles in my first 6 months of the Digital Disney World blog. I want to thank everyone who has joined me on this new adventure. Whether you have been reading since the beginning of the year or only for the past few postings, I sincerely appreciate you taking the time to read my thoughts on Walt Disney World. My very first article back on New Years Day was entitled "Podcasts, Podcasts, Podcasts." I thought it made sense to begin Digital Disney World with an article that really exemplified how modern technology keeps us connected with the vacation kingdom. Along those same lines, I decided to bookend my first six months with "Blogs, Blogs, Blogs" to highlight another very popular and very modern way to communicate our thoughts and feelings with people around the world. When I started Digital Disney World, I actually knew very little about blogging. Over the past several years, I kept hearing the word "blog" but wasn't really sure what it was all about. As I mentioned in my first article, throughout 2010 I became a big fan of several Disney World podcasts. I would often hear the hosts talk about specific blogs and I finally decided to check some of them out for myself. I was pretty impressed with the blogs that I started reading and wanted to learn more about this new medium. Most of them looked like regular websites and often didn't even mention the actual term "blog" anywhere. I assumed that these websites were professionally created and that the articles must have been posted by experienced writers. I couldn't have been more wrong. After doing a little research, I learned that a blog could be created by nearly anyone who is comfortable using a computer. It wasn't long before I decided to jump into the Disney online community with both feet! The first thing that got me excited about moving forward with the creation of this blog was the cost. There was none! I was happily surprised to find several blogging hosts that assisted ordinary people in producing relatively professional websites. I chose Google's blogger.com and I was off and running. It was pretty easy to come up with a unique angle to write about when it came to Walt Disney World. I am definitely someone who embraces new technology, and I am always looking at fun new ways to experience Disney. If I couldn't live near the mouse, I thought it would be fun to write about it on a regular basis. As I began this blog, I intended to write mostly about the use of modern technology and how it can be used to keep us connected to Walt Disney World. However, I am also somewhat of a WDW history buff and soon decided to mix in articles that celebrated important dates in Disney World's past. I enjoy researching the details and facts about attractions, resorts, etc. As I have mentioned in a previous article, my family often refers to me as the Cliff Clavin of Disney. I don't mind the comparison as long as I don't become too annoying to those around me. My passion for "The World" is pretty obvious and once I start talking about it, it can sometimes be difficult to shut me up! Over the past six months many people have asked me why I decided to get into blogging. Often times they ask if I am doing it to make money or if I'm trying to make a career out of it. The answer is no to both of these questions. While it is possible to actually make decent money if your blog becomes extremely popular, most bloggers will never generate any serious income. The reason I write the Digital Disney World blog is simply for the enjoyment of doing it. Every three or four days I get to sit down at my computer and "virtually" put myself in Walt Disney World for a couple hours. Although I may not physically be in one of the theme parks, I typically put on some Disney background music and mentally escape to the place that Walt built. There are alot of great Walt Disney World blogs out there. I intend to write about many of them in the coming months. In the meantime, you can simply do a Google search of "Disney World blogs" to start finding people, like myself, who are also writing about their favorite subject. You will even find that the Disney Company actually writes their own blog about the parks. I featured this one back in article #20. If you are interested in starting your own blog, whether it be Disney related or not, I suggest you click on the "Create Blog" tab in the upper right corner of this website. Google makes it easy to get started. Once again, thank you so much for taking the time to read the Digital Disney World blog. I look forward to writing another 50 articles this year! Today we say happy 23rd birthday to Disney's Grand Floridian Resort and Spa. On this day in 1988, it became the fourth Walt Disney World resort, joining the Contemporary, Polynesian and Fort Wilderness. All three of these resorts opened in 1971, so the Grand Floridian was the first to be built in over 16 years. When the resort opened it was called the Grand Floridian Beach Resort. It wasn't until the fall of 1997 that its name changed to what we have now. Whatever the name, this deluxe resort has always been known as Walt Disney World's finest. Disney's Grand Floridan Resort and Spa has several attractive features. First, like the Contemporary and Polynesian, it is located right on the monorail. It boasts the best position on the line because the Magic Kingdom is only one stop away. When you would like to get to the park as quickly as possible, there is no better place to stay. You are literally only a few minutes from the most visited theme park in the world. 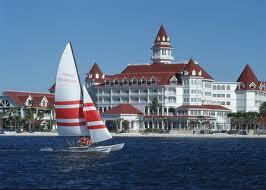 Second, the Grand Floridian is well known as one of the nicest resort hotels anywhere. As soon as you walk in the front doors you know that this place is something special. With its five story lobby boasting Italian marble floors, stained glass domes, and cage elevator, you know that this place has class. Often times there will even be a live orchestra playing as guests stroll through the lobby. This resort was inspired by Victorian era beach resorts from the late 19th and early 20th centuries. It was actually modeled after the Hotel del Coronado just outside of San Diego, California. In addition to the main building that houses the lobby, the Grand Floridian has five, detached outer lodge buildings. Each of these is named after an island in the Florida Keys. This resort is also known for having many excellent dining establishments including Victoria & Albert's. That restaurant has the distinction of being the only one in Central Florida to currently hold AAA's Five Diamond Award. It has won this award every year since 2000. As you might expect, as nice as the Grand Floridian is, it is also very expensive. My family had the pleasure of staying in this resort for three nights back in 1990 when it was "only" about $200 a night. As of this writing, the least expensive rooms during value season start at over $400 per night. During busy times of the year, you could easily pay double that for a standard room and even as much as $3,000 per night if you want a fancy suite! The only practical way to stay at this palace for the average family is to become a member of the Disney Vacation Club. There are even rumors that Disney will be building a dedicated DVC addition to the Grand Floridian in the next couple years. Although it may cost a small fortune to stay at the Grand Floridian, it doesn't cost anything to "visit." In my opinion, this is one of the greatest things about a Walt Disney World vacation. As long as you are staying on property, you can visit any other resort and even use their pools in many cases. Between the great restaurants, numerous shops, and beautiful grounds you could easily spend half a day at the Grand Floridian. Even if you will eventually crawl into bed at one of the $79 a night All-Star Resorts, the cast members at the Floridian will treat you like royalty as you stroll around their spectacular resort on the Seven Seas Lagoon. So the next time you are vacationing at Walt Disney World, I highly recommend that you hop off the monorail one stop prior to the Magic Kingdom. Happy birthday Grand Floridian! There are so many reasons that people love to go to Walt Disney World. For many it is the amazing and unique attractions that can't be found outside of a Disney park. For others it is the variety and quality of the dining experiences. In addition to the tangible things, most guests would agree that spending time in Disney World makes us "feel" a certain way. There isn't necessarily a word to describe this feeling, but those of you who vacation there know what I'm talking about. Just like a good movie would be lacking without a good soundtrack, the same is true for a good theme park. Listening to the music of Walt Disney World brings back great memories for me. For many of us, it also has the power to mentally take us back to our favorite place. A great website that helps us achieve this is MouseWorldRadio.com. Mouse World Radio was created by Mike Newell who is well known in the Disney online community. As I wrote about in an earlier article, Mike is also one of the core members of the WDW Today podcast. He is the technical brains behind that podcast and does a great job in that role. Mike started Mouse World Radio many years ago to bring Disney World fans the music, background audio, and attraction soundtracks that we all enjoy when visiting the parks. Something that makes his website stand out is that much of what we are hearing was actually recorded by Mike himself, using professional recording equipment. Although there are a few Disney World souvenir albums available for purchase, a majority of what we hear on Mouse World Radio is not available commercially. MouseWorldRadio.com features six different "radio stations" for us to enjoy. Most of them can be listened to for free, however a couple stations require a subscription requiring a monthly fee. Each of the stations is set up just like a radio station so we don't know what is coming next. This actually makes listening fun as we anticipate what might be coming up. Although we don't know what to expect for much of the day, a couple of the stations incorporate a "real time" feature. For example, MouseWorld Radio 1 plays Magic Kingdom entrance music between 8am and 9am, just like you'd expect to hear while waiting outside the gates of the park at this time of the morning. Then, at 9am we hear the music of Main Street, as if we had just entered the park and were strolling toward Cinderella's Castle. You are also liable to hear parade music at parade time (3pm) and the Wishes fireworks display soundtrack as I am listening to while writing this at 10pm. This real time feature does a great job at taking us back to the parks throughout the day. I love listening to park opening music on my way to work. Yes, I end up arriving at my "real job" instead of Space Mountain, but it is fun nonetheless. In addition to the website, there is now a corresponding Mouse World Radio app for most smartphones. I recently installed the app on my iPhone and it works great. It is a simple little app that plays the live stream from MouseWorld Radio station 1X. It has a very basic start/stop interface and the current track title is usually displayed on the screen. The app is free from the iTunes store and I would suspect it would be free for other smartphones as well. I highly recommend both MouseWorldRadio.com and the app to anyone looking for a little Disney World music to get you through your day! Also, be sure to check out Mike Newell and the rest of the crew on the WDW Today podcast. You won't be sorry! I am now approaching the six month anniversary of the Digital Disney World blog. As you can tell from many of my previous articles, I am a big proponent and user of the iPhone. As you can imagine, I have several folders on my iPhone filled with my favorite Walt Disney World websites and apps. There are dozens of great Disney apps available and we see new ones coming out all the time. It looks like Apple's App Store will be providing me with great subjects to write about for the foreseeable future. This article is no exception. The Walt Disney World Secrets Notescast App is one of those dual purpose apps that is great to use both at home as well as when touring Disney World. It is broken down into three major sections. First, you will find the Walt Disney World "Secrets" section. Next is Walt Disney World "Fun Facts." Last, but not least, is the WDW "Hidden Mickey Tours" section. There are a few more sections listed on the home page that include information related to TimeStream Software, the creator of the app. The second section of the WDW Secrets App is entitled "Fun Facts." This is where you will learn numerical facts such as attraction dimensions, ride speeds and weights. It is a much smaller part of the app than the "Secrets" section, but interesting nonetheless. The final major section, "WDW Hidden Mickey Tours," is another fun resource to use while touring the parks. It first describes what a Hidden Mickey is all about and then breaks down the tours by theme park. This is a part of the app that I used quite a bit on our most recent trip, and it definitely helped to pass the time while waiting in lines. The Walt Disney World Secrets Notescast App is available through iTunes for $1.99. There is also a newer "Gold" edition of the app that is $2.99. It appears that the major difference is that the Gold edition includes photographs. In addition to the app being offered for iPhones, iPods, and iPads, there is actually a version available in the Android Market for owners of these types of devices. I certainly recommend this app for whatever smartphone you may have! As I have mentioned in previous articles, my family and I are members of Disney's Vacation Club (DVC). We purchased our membership back in 2009 and our "home resort" is Bay Lake Tower at Disney's Contemporary Resort. 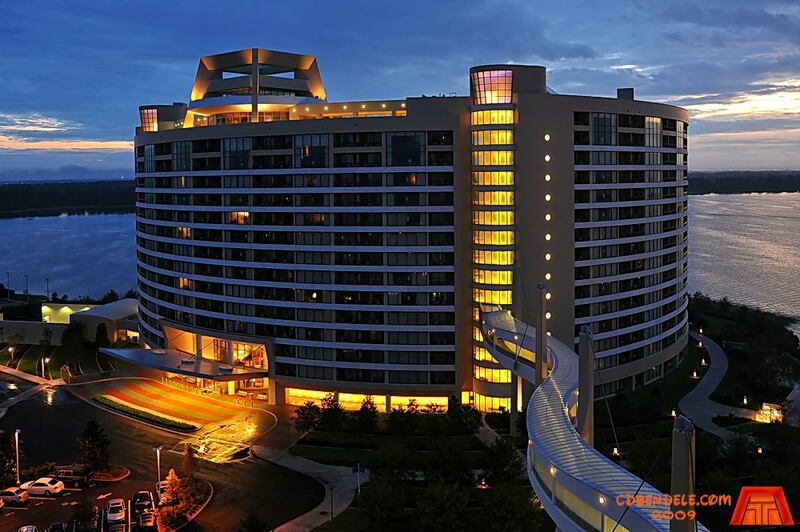 Although we have made three DVC trips to date, we will be staying at Bay Lake Tower for the first time in July. In doing some research on the fairly new resort, I came across a website that is specifically dedicated to this neighbor of the Magic Kingdom. Just as there are many sites that pay tribute to specific Walt Disney World attractions, there are also websites that focus on individual resorts. BayLakeTower.net is a great website created by a Walt Disney World fan. It is organized into two major sections. The first tab is simply labeled Bay Lake Tower and is basically a photo and video gallery. This is a good place to see pictures and floorplans of the different style rooms and villas. There are also interesting photos from the Top of the World Lounge including inside, outside, and views looking out from the lounge. You can also see pics of the pool and courtyard, Magic Kingdom fireworks, and even a construction video of the resort. The second major section of this website is entitled "Promo and Concept." Here you will find a bunch of interesting material related to the promotion of the resort. Most of what can be found here was used in marketing Bay Lake Tower to current and prospective DVC members. There are pictures, videos and the actual "mailer" sent to members. You can even read the original press release that announced the resort back in 2008. This section of the website concludes with a fact sheet that lists details about Bay Lake Tower as well as the Disney Vacation Club. Although there are really two major sections of BayLakeTower.net, there is actually one additional tab that is worth noting. This tab is labeled "ContemporaryResort.net" and is a link to the sister website to BayLakeTower.net. As you may guess from the title, this site highlights the Contemporary Resort. It is very similar to BayLakeTower.net in that it includes photo and video galleries as well as fun information about the resort. I definitely recommend both of these websites to anyone who is planning on staying at either resort. They are also fun sites for those who have vacationed here and would like to revisit their experience through pictures. There are many great websites that feature Walt Disney World travel planning and information, but there are few that highlight the amazing history of the the number one vacation spot in the world. While listening to a recent WDW Radio podcast by Lou Mongello, I learned of a great site for Disney enthusiasts. It is called Yesterland.com. While a majority of the site is dedicated to the long and storied history of Disneyland, there are several sections that specifically focus on Walt Disney World. Yesterland.com was started back in 1995 by a gentleman named Werner Weiss. As Werner describes on his website, he had a bunch of old color slides of Disneyland from the 1960s and 1970s of attractions that were no longer there. Werner had the slides digitized and wrote about the attractions as if they had been moved to a park called Yesterland. This site became a huge hit as it was one of the very first dedicated to Disneyland. It actually came online prior to the official Disneyland site! Over the past 15 years, Werner has posted hundreds of "photo essays" all about the history of both current and extinct attractions. Since Yesterlands beginnings, he has expanded his articles to include Walt Disney World, Disneyland Paris, Disney Vacation Club and Disney Imagineering. As I am first and foremost a fan of the Florida property, I find the Walt Disney World writings to be the most interesting. I have learned a great deal from browsing this site and it is obvious that Werner enjoys taking us down memory lane. My favorite articles are found under the section labeled "Yester World." This is where we find most of the postings related to Walt Disney World. 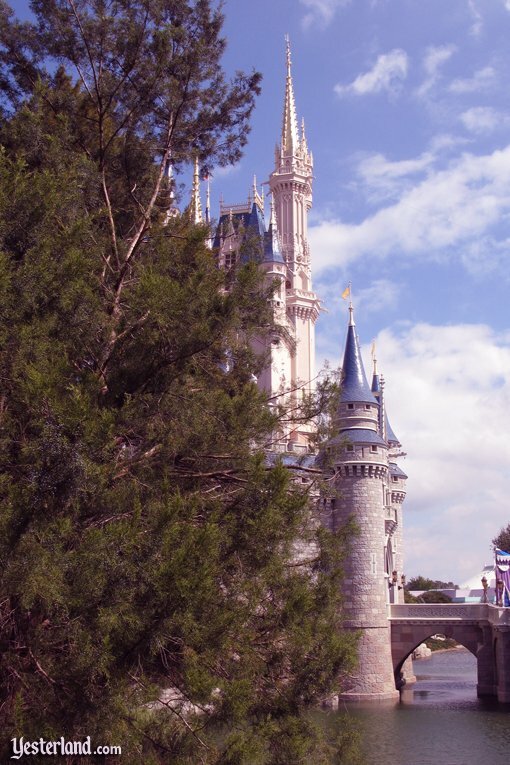 I have to say that I love the photo essays entitled "Magic Kingdom Then/Now." 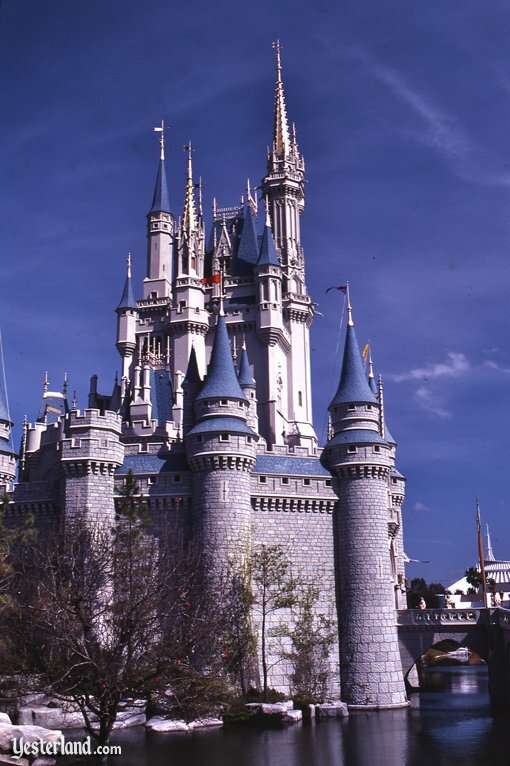 These articles include amazing photography showing different parts of the Magic Kingdom. Each section has a picture of the "old days" with its corresponding current picture displayed right below. Werner points out the differences in each era in explicit detail. It is amazing to see how much the park has changed, especially in the foliage. This is the only website that I've found that highlights the changes to the parks using this style of comparative photography. These are interesting and nostalgic articles that are really fun to browse, especially by long time visitors to Walt Disney World. Although my primary interest lies in the sections about Walt Disney World, Yesterland.com focuses a great deal on the evolution of Disneyland. I have very little knowledge of Disneyland's past and I find these articles to be quite enlightening. I'm sure that anyone who has spent any time in the California parks will really enjoy the articles and photographs related to Walt's original creation in Anaheim. Whether you are a fan of Disneyland or Walt Disney World, I can't recommend Yesterland.com enough. It is truly a site that should be saved in the bookmarks of all Disney park enthusiasts! In writing this blog, I am always looking at different websites for fast facts about Walt Disney World. One of my favorites is Disneybythenumbers.com. This is a simple, yet comprehensive site filled with numbers based facts about all of the Disney Parks. However, a majority of the information is on Walt Disney World as it is the largest of the Disney destinations. Although the primary focus of Disneybythenumbers.com is to provide quick facts about each park and attraction, there are a number of other features that make it a fun site to check out. Disneybythenumbers.com is a great name for this website because it describes exactly what you are going to find here. Anything that is factual and has a number associated with it will be listed in the appropriate section. Opening dates, costs, ride lengths and other fun tidbits can be found for most attractions. 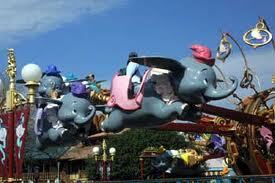 For example, when we look up "Dumbo the Flying Elephant," we find that it opened in 1971, has 16 ride vehicles that can carry 32 guests, and it takes 1.5 minutes to ride. Depending on the attraction, there may be only a handful of facts or as many as a couple dozen. Most of the time, I find the facts to be very accurate and interesting. features to browse. It is obvious that the creator and host of Disneybythenumbers.com, Tony Caselnova, is a huge Walt Disney World fan. He once worked as a security cast member and is hoping to have the opportunity to get back to Florida and work there again. Like me, Tony currently resides in the Northeast and continues his passion for Walt Disney World through his website. I certainly recommend visiting Disneybythenumbers.com. 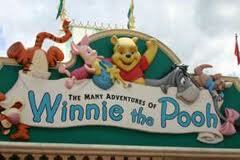 Today we say happy 12th birthday to The Many Adventures of Winnie the Pooh attraction at the Magic Kingdom. 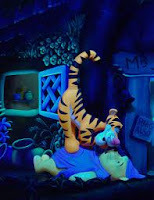 Opening on June 4th, 1999 in Fantasyland, it is a 3 minute "dark ride" where guests ride in honey pots through different scenes showcasing Winnie the Pooh and his friends. These honey pots are advanced ride vehicles that are capable of making you feel like you are bouncing as well as floating in water. It is a fun attraction that is enjoyed by guests of all ages. The Many Adventures of Winnie the Pooh was not the original attraction to occupy its current location. From the Magic Kingdom's opening day in 1971 until 1998, this spot was home to Mr. Toad's Wild Ride. Also a dark ride, this attraction was a favorite of many park guests. It was based on the characters from the children's novel, The Wind in the Willows. Although it featured outdated, two dimensional figures and props, it was a fun ride and still exists at Disneyland in California. For those of you who never had the chance to ride the Florida version of Mr. Toad, it was unique in that there were two separate boarding areas and the vehicles traveled through different show scenes. 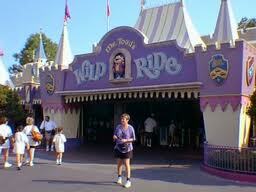 However, the Magic Kingdom version was similar to Disneyland's in how the ride concluded. Guests head down a dark tunnel and apparently collide head-on with a train. After the collision, the ride vehicle travels through the final scene which features fire and devils bouncing up and down. I'm pretty sure that this is the only attraction in "Disney" history where guests die in a horrific motor vehicle accident and end up in hell! However, all is well when the ride concludes and guests "escape" to the unloading area and disembark. When the Imagineers created the Winnie the Pooh attraction, they payed homage to Mr. Toad in several ways. 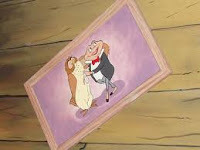 First, observant guests can find paintings of Mr. Toad and Moley near the beginning of the ride in Owl's house. The one of Mr. Toad depicts him handing the deed to the attraction over to owl. The other major way that the imagineers created a lasting tribute was by placing a Mr. Toad tombstone in the back of the pet cemetery on the grounds of the Haunted Mansion. It was their way of memorializing a classic attraction that many people feel should never have been removed. As much as I like The Many Adventures of Winnie the Pooh, I was certainly disappointed when they removed Mr. Toad and look forward to eventually riding the Disneyland version in the future. The Many Adventures of Winnie the Pooh is a very popular attraction and the lines are typically long throughout the day. Thankfully, it is a ride that utilizes the FASTPASS system, which allows you to come back later in the day with virtually no wait. However, less than a year ago, the queue was completely refurbished and has now become "interactive." While waiting, young children can walk through a set of hands on exhibits that parallel the normal queue. As guests get closer to the loading area, there are virtual "walls of honey" that can be rubbed by kids and adults, revealing beloved characters from Winnie the Pooh. Disney is doing an amazing job of continually adding interactive queues throughout the parks with the most recent example found over at the Haunted Mansion. As with many attractions in Walt Disney World, guests disembark the Many Adventures of Winnie the Pooh right into a gift shop. It is always a fun challenge to see how quickly we can rush our four year old through the store and towards the next attraction. I mean, at this point he has probably conned us into a Pirate sword and something with ears on it!